What Is That On The Train Moving Through The Local Area? Residents of our area keep a wary eye on what’s coming down local railroad tracks. Maybe this can be traced back to the 1980s, when radioactive rubble from Three Mile Island (TMI) passed through on the way to Idaho. That rubble caused an uproar. Protests resulted in railroads making a number of concessions. For example, the canisters of deadly materials were put on dedicated trains. Buffer cars were placed on either side of shipment railway cars as a safety measure in case of collisions. 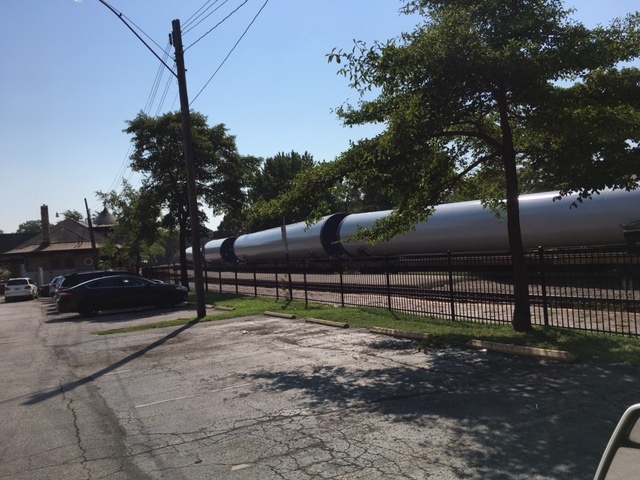 In recent weeks, we’ve had several inquiries about huge tubes passing by on the rails. What do they contain? Do they pose any hazard? We took some time to look into it. Railroad officials are much happier talking about these shipments than they were talking about the “hot” materials coming down the line from the 1979 TMI plant disaster. Union Pacific spokesperson Calli Hite explained that the cylinder shipments are part of a Wind-2-Rail program. The huge components being transported by rail are turbine pieces for wind farms to generate renewable electrical energy. Hite referred to advisories detailing logistical challenges of delivering towers, hubs and blades around the country for wind generation. These shipments may present challenges, but I bet they’re a piece of cake compared to packaging a melted nuclear reactor core for transport through cities across the country. The controversial TMI shipments spurred my interest in environmental journalism. A $5,000 grant from Gannett allowed the Times to visit TMI and to cover the shipment rail route to Idaho. That inspired a visit to the University of Colorado at Boulder to be at the founding of the Society of Environmental Journalists (SEJ). Now, more than 1,000 SEJ writers from across America will soon meet in Pittsburgh to discuss the current U.S. environmental scene. Fossil fuel issues, climate change and “super storms” are sure to be on the agenda. It’s not essential to go to “Steel City” to find dedicated nature and environmental advocates. There are so many here at home. Maybe because Webster Groves Nature Study Society was founded here in 1920. We’ve profiled many of its members – most recently Karen and Al Haller. Audubon Society is active locally as well. Sue Gustafson, Linda Tossing and Stephanie Schroeder have fought the good fight to preserve wildlife habitat in St. Louis. I’ve enjoyed talks with Jennifer Schamber, Tammy Behm and Robert Weaver about the fate of pollinators. The folks from Microgrid Energy and Jim and Judy Stroup are always ready to offer updates on solar power. Also well-represented here are great rivers organizations, Sierra Club, Nature Conservancy and more. Of course, the Times will always be indebted to locals Diane Sheehan and Debbie Wilson. They alerted us to those TMI shipments coming down the railroad tracks in 1988. This entry was posted in Environment, Opinion. Bookmark the permalink.